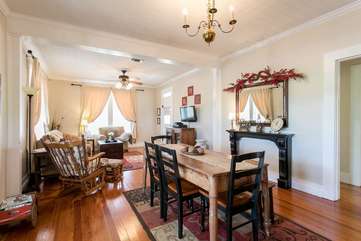 Located just on the edge of town this seventy five plus year old home makes the perfect get-away for family or friends. The front yard is fenced and offers two porches with views of country life. The pasture across the street offers not only a working ranch but also wildlife and extraordinary sunsets. Bringing your children? —enjoy the spacious fenced yard which surrounds the house. Post Oak Haus was built in the era of two front doors. Today the door to the right is the one that is used to enter the house (on the Fulton Street side). Inside the house is a spacious living-dining room with comfy sofa (queen sleeper) and two chairs all facing the 32” flat screen television (dish programing) with DVD. An antique harvest table in the living room easily seats six to eight people. Notice the quality woodwork that is original to the house including the built in china hutch in the dining room. Enjoy the fully equipped kitchen completely furnished with all your cooking needs. Three bedrooms and three baths are available to rent. Each bedroom has a queen bed. The front bedroom is accented in a cottage-style blue, white and yellow décor. The second bedroom is decked in sage and chocolate and the third bedroom has a rustic, barn wood feel all decked in denim blue with red and white accents. All are decorated to perfection with luxury and comfort in mind. The three bathrooms all have a tub/shower combination. The third bedroom is locked and only opened for 5+ guests. For 4 or less guests, the fee for all three bedrooms is the higher rate. The Post Oak House was just perfect for a couples’ weekend. The fact each bedroom had its own bathroom was ideal. The house was very charming and inviting. We will definitely be returning! WE all had a wonderful stay. We really liked the house as well. First time staying at this house and we had everything we needed a more. We brought our coffee and they had coffee. Thank you for a great house!! Excellent place with a nice outdoor area. If you need a lot of space and bedrooms this is the one. If you're 1-4 people and staying for just a night or two with no need to cook this could be overkill.